Wow a big card! +5 coins and attack is very impressive even if you don’t get it every time. This guy is certainly going to bring triumph and disaster. 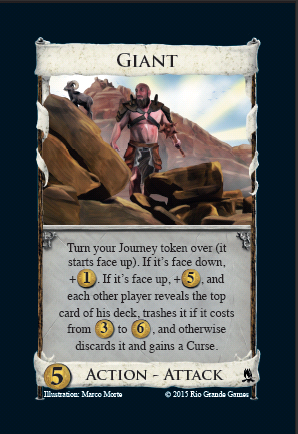 It will feel like a disaster if you play your giant for +1 coin, flip your journey token, but it gets trashed from your deck before you can play it again. You’ll have to buy another one won’t you, or maybe you should have bought a second giant already? How bad is the attack? It would be trouble except that the giant is so slow. Unless your opponents can play a lot of giants you might be able to ignore it. When you have more than one opponent you might get more attacks on your deck and then you might need to worry. Traders, beggars, and silver in general look like good defenses against a giant. The defender will generally have some control of what the attack will do since it is the defender that puts most of the cards into the deck. If you buy a lot of fool’s gold then the giant will be giving you curses. Even so the giant attack will probably be quite random since, like a jester, it only looks at one card. We’ll see streaks of luck where the same sort of card is turned over again and again. How good is the coin income? If you can use those +5 coins to buy key cards like platinum then it is excellent. Of course, having to get +1 coin first is very bad but perhaps you can use those early turns to gain some cards with +buy, ready for when the giant gives you the real money. Maybe if you can play your giants very often you can forget the bad start and look towards a healthy income of +6 coins from two plays. I suspect there will be some interesting end game decisions on whether or not to play the giant and flip the journey token, especially if there’s another action that could be played instead. I also suspect that these decisions will feel bad every time as you’ll be weighing up income in the current hand against a gamble on what you need in a future hand. Triumph or disaster will be waiting.